The study has two main objectives. Firstly, to find the most economical dam type for the Sporðalda site that fulfils the operational requirements. Secondly, to gain a general understanding of dam construction and to investigate how the pore-pressure affects the stability of dams both under normal operation and during earthquakes. The final recommendation will be based on all three criteria with the financially criterion as the deciding if the two others are fulfilled satisfactorily. The maximum water level in the reservoir during the probable maximum flood (PMF, 3500 m3/s) is estimated to 340 m.a.s.l. The crest elevation is estimated to 342 m.a.s.l based on the height of the waves in the reservoir in order to avoid overtopping. The elevation of the bedrock along the dam axis is shown on the figure. The longitudinal section of the Búðarháls dam which is 28 meter at the highest point. The minimum bedrock elevation is 314 m.a.s.l hence the maximum height of the dam will be 28 meter and the average height will be 9 meter. It further has to be designed to resist earthquakes with a ground acceleration of 0,25 g, since it can be expected in the area. The dam will also consist of two small fuse plugs south of the main dam. However, these structures are very small compared with the main dam and are therefore neglected in this study. Two types of dams are considered for the Búðarháls site, a concrete faced rockfill dam (CFRD) and an earth core rockfill dam (ECRD). A cross section of an earthfill dam. The core, zone one, is the impervious element. Zone two is the filter material which prevents erosion of the core. Zone three is the shell material, and zone 4 is the rip rap (wave protection). The CFRD consists only of rockfill which main purpose is to provide a stable foundation for the concrete face slab on the upstream surface. The face slab is the impervious element and it is connected to the bedrock by the plinth, which is a reinforced concrete structure anchored to the bedrock. The face slab and the plinth are two independent structures and the connection is fitted with rubber and cobber water stops to allow the face slab to move when the dam settle during impoundment. The face slab is typically 0,3 meter thick and divide into 15 meter wide sections. In their longitudinal direction, they will extent all the way from the plinth to the crest of the dam. The upstream and downstream slope inclination are typically 1:1,3 and 1:1,25 respectively. The ECRD consists of four different type of fill where the core, zone one, is impervious. In Iceland, it consists of moraine which is a mixture of sand, silt and very little clay in a certain ratio. Zone two, the filter consists of alluvium gravel and its grain distribution prevents piping erosion of the core. Zone three, the shell material is even coarser than zone two and is typically some sort of rockfill. Zone four, the rip rap, is wave protection and consists of large boulders. The upstream and downstream slope inclination are typically 1:1,8 and 1:1,6 respectively. The main difference between the CFRD and the ECRD is the location and type of impervious layer, and thus the pore pressure distribution. In the CFRD, the pore pressure is close to zero throughout the entire dam, since the impervious layer is a concrete slab on the upstream surface of the dam. Whereas in the ECRD, the pore pressure is close to the hydrostatic pressure of the water in upstream side of zone two, three and four. It then slow decreases to zero through the core, zone one. Thus, the CFRD’s slopes are more inclined than the ECRD’s since the strength of the rockfill is not compromised by the pore pressure. The steeper slopes of the CFRD are the reason it in some cases is cheaper than the earthfill dam. The earthfill dam is a far simpler structure than the CFRD and normally the cheaper options, but when the height of the dam reaches a certain level the CFRD becomes the cheapest simply because of it requires less fill. 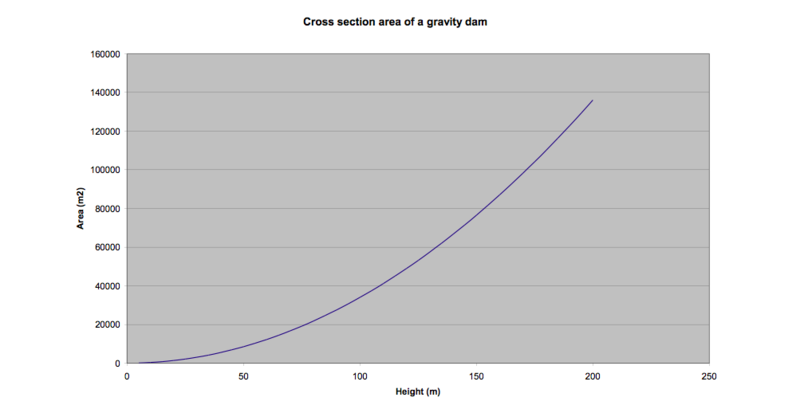 The cross section area increase in the second power of the height of the dam, and thus the amount of fill. The figure shows how the area of a rockfill dam increases exponential with the height of the dam, and thus the amount of fill. A cost estimate for both types of dam was calculated on the basis of the land profile and the cross sections described in the section above. The price calculations clearly show that the ECRD is the cheapest, but what are the advantage and disadvantage of the two types? 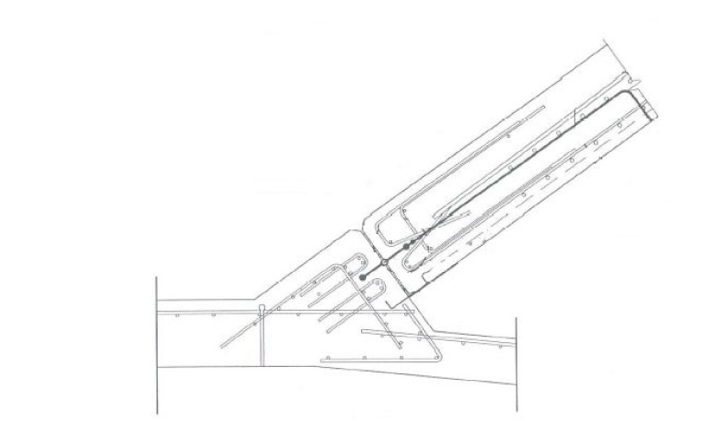 The designs can be evaluated on two levels, how well it will fulfils the operational requirements and how complex it is to build. Under normal operation there is not any difference between the two types of dams. The CFRD has to advantages. First, it is very safe, since the only credible mechanism of failure is erosion by sustained overtopping (Cooke, 1991). Second, its fill is dry and it makes pore pressure built up impossible (Cooke, 1991). It can cause problems for the ECRD in two cases, during earthquake and if the reservoir is emptied quickly (rapid drawdown) (Tedd et al, 1997). The core materials of the ECRD, sand and silt, have liquefied during earthquakes both in dams and other structures (Seed, 1979). Thus it has to be considered in the geotechnical design process and preferable simulated numerically. If the ECRD is designed correctly, liquefaction is not an issue (Erlingsson et al, 2006). An ECRD similar to the one in question was simulated using a peak ground acceleration of 0,4 g and liquefaction was not plausible. Furthermore, the earthquake load of 0,25 g is just on the limit of where it is necessary to make an earthquake evaluation of the design (Seed, 1979). If the reservoir is emptied too quickly and the upstream side is not drained sufficiently, it can compromise the safety of the ECRD. Since the fill in the upstream side then will remain saturated and have its unit weight increased by the water, but will lack the stabilizing effect of the water (Tedd et al, 1997). This is very unlikely to happen at Búðarháls. The reservoir has three outlets, the spillway, the fuse plugs and the intake for the turbines. The spillway is a conventional overflow weir at 337,5 m.a.s.l, the lowest elevation of the fuse plugs are 334 m.a.s.l and these devises will only operate during floods. Their outlet will therefore be balanced by a substantial inflow. The outflow through the turbine intake is maximal 250 m3/s, thus none of the outlets have the capabilities of empting the reservoir quickly. 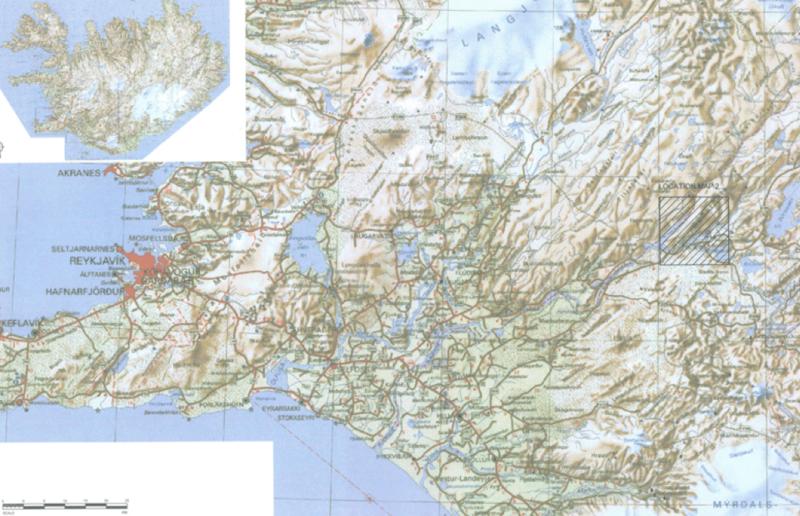 The ECRD is the most common type of dam in Iceland, since rockfill is very accessible in Iceland, whereas the first CFRD in Iceland is currently being built (the Kárahnjúkar dam). It is an Italian contractor that is constructing the Kárahnjúkar dam, thus no Icelandic contractor has experience with that type of dam. 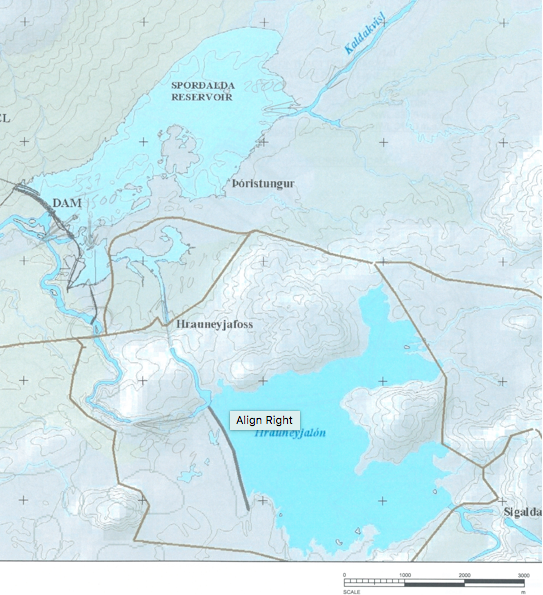 However, it is very unlikely that a foreign contractor will bid on the Sporðalda dam, which means that it will probably be an inexperienced contractor who would be awarded the contract. Further, the CFRD is a far more complex structure that the ECRD and thus more complications can arise during construction. The conclusion of this study is that the earth core rockfill dam (ECRD) is the best solution for the Búðarháls site. The Búðarháls site is located in southwest Iceland on the Kaldakvísl just before it meets the Þjórsá. The dam will be 1300 meter long, have average height of 9 meter and be 28 meter at the highest point. Two types of dams were considered, a concrete faced rockfill dam (CFRD) and an earth core rockfill dam (ECRD). The main difference between them is the location of the impervious element. The upstream location in the CFRD enables it to have steeper slopes, since the pore water pressure does not compromises the strength of the rockfill. No Icelandic contractors have experience with the CFRD and it is further a more complex structure. The chance of it exceeding the budget is therefore far greater than the ECRD, which is the most common dam type on Iceland. Hence, the ECRD is recommended. Today, Jakob Madsen is the founder of Bookanaut and Vupea. Bookanaut is a platform for sport and health which he has founded together with Lasse Lundberg and Morning Train. Forsikring.io is a guide to insurance which he has founded together with Nanna Gorm. This entry was posted in Dam design and tagged frontpage. Bookmark the permalink.